Rug arrived pretty fast. I'm only giving it a 4star because they colors are more muted than in the picture, I was expecting a little more vibrant, other than that, nothing wrong with the rug so far. 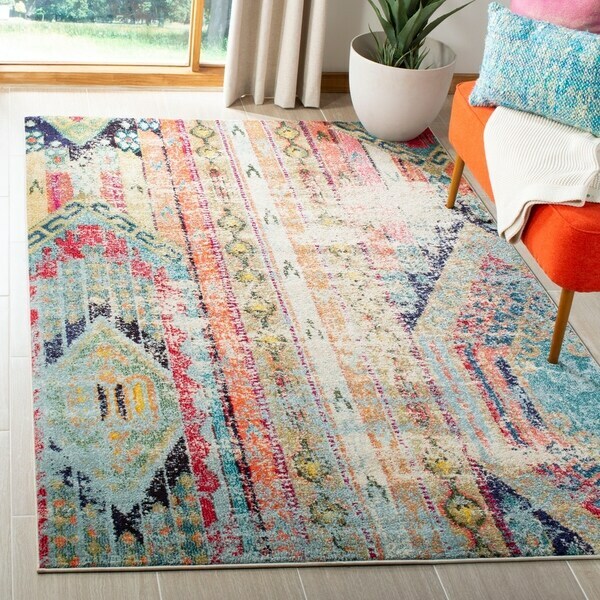 I purchased two rugs (4x5'7) and an 8 foot runner of this Multicolored Distressed Bohemian rug and could not be more pleased. The colors are beautiful, the pattern is unique and the quality is outstanding. The lush texture of this rug makes my lie down and roll on it. This will be the perfect highlight for my newly decoated bedroom. As I've Come to Expect - great product! I purchased this for my granddaughter, who is decorating a new bedroom. We used the basic colors of this to add linens, accessories, and a rug. She loves it! Nice rug, I love the colors. Did have to put weights in corners to help it adjust from being rolled up, to flat. That did not take long though. It looks great and fortunately, but unfortunately, my dogs love it too. 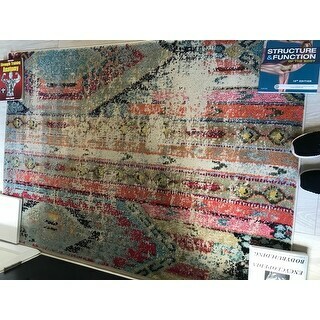 Excellent quality in this Safavieh Monaco Vintage Boho Rug. I love the colors in this rug. This is the second rug like this that I have ordered from Overstock. You will not be disappointed if you order this rug. This one was ordered for my sun room. I just love the colors. Would recommend to a friend. I like this rug. The picture on the internet is quite accurate so if you like how it looks, you'll be happy. I also bought the runner and like it although it is distressed a bit differently than this rug which doesn't bother me but it might annoy some people. 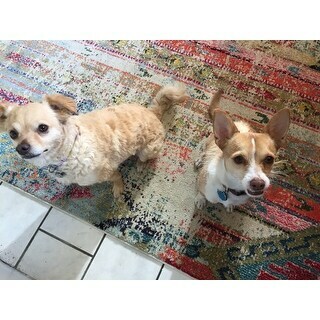 They are not thick rugs so if you want a thick rug, these are not for you. You definitely need a rug pad or furniture on them to keep them in place and a pad would make them more comfortable. Stunning! This rug is just inside my front door and it is beautiful. There are several different colors, so be sure to order the correct one. The colors are a little more vivid than what is shown, but it’s soft and stays in place without a pad. I did have to use books for a couple of days for the corners, but it’s perfect now. I would buy again and again. Great rug for my foyer. Love the multi-color distressed look. I recommend Safavieh rugs! Safavieh products are all outstanding. This rug is thick and the colors are vibrant. I have many of their rugs and would definately recommend this and all their rugs. You won't be disappointed and the price is good. The colors in this rug are beautiful!!!! Attractive design. Not very thick. I like it a lot which means it will look excellent in our Florida coastal condo. The coloring will pull out my accents. I can't wait to layer it when we arrive in January. Great look. We love it! A tad brighter in person than pictured. Can match almost anything with it. I love the color, pattern, and style of rug. It doesn't look high-end, and is not as plush as I would like...but cute! Put this rug in my kitchen and it makes me happy every time I walk in there. Colors are beautiful. I really want one for every room. Love this rug! I was looking for something for my kitchen so it needed to be mostly darker colors. It's made well and I've had it at least 6 months and no stains. For a kitchen rug it's everything I wanted. I love it so much I bought another in a different size for the living room. I was not happy when I saw this rug in person. It looked so so different than the image on the website. The colors were bright and unattractive and it just felt cheap overall. Love the colors! Beautiful addition to my room. Love this rug. Colorful but not overwhelming. I have the rug and runner creating a great first impression as you enter my new home. Purchased for my kitchen. Love the colors! They are pretty vibrant. Paired with the Simple Living Playmate dining set in gray and works perfectly. I love this rug. 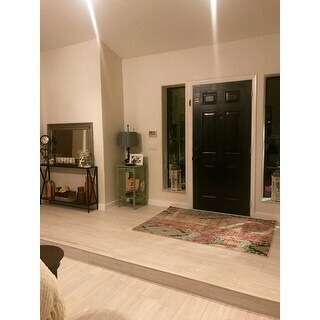 I purchased the 4 x 5’-7” for my entryway and love the colors and pattern so much that I am planning to order a larger area rug - same pattern. 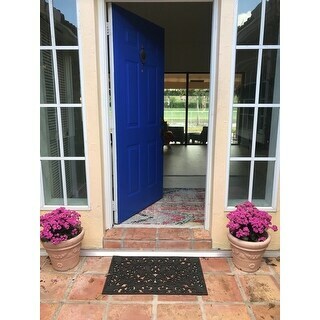 It is the perfect thickness and even though it gets a lot of traffic in the entry way it has helps up well. I highly recommend! So gorgeous and arrived right on time!! "Can u wash it "
"It says there is pink but it looks more like red. what colors are dominant in the rug?" I would say that the most dominant colors are Pink and Orange! I would say most dominate is a rose color and turquoise. Just keep in mind it has quite a bit of beige in the back ground to offset the strong colors. I would describe it as cream background, with main colors - cranberry, coral, country blue & teal. I love it -it fits in well with my southwest decor. Sandy J. "this question is for anyone who has bought this rug. In person, does it look like southwestern motif? Or not at all?" that has never occurred to me. It's a little bit flowery. I think of it more as an old west or vintage painted parlor floor. Not really. but think it would go with about anything..especially the colors. I love it! so comy to walk on. really pops the room..
"Is this indoor only or cannot be used outdoors?" 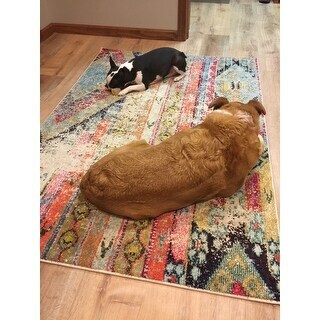 This is an indoor use only rug. replacing a rug in the house, colors are perfect and I love the faded look and price.